A hundred years ago, it was a feat to get the simplest message across country. But today, with the widespread use of the Internet and the telephone, it is easy to express the appropriate sentiment to almost anyone in the world by sending a thoughtful gift of carefully selected flowers. You can order flowers by phone, online, by fax, or at your favorite local florist, with flower delivery available around the world. And just as technology has made the process easier, so will these quick tips. Most leading florists provide same day delivery nationwide, as long as you order by mid-day. This is especially useful for sudden emergencies or forgotten occasions. But whenever possible, it's a good idea to order flowers one or two days in advance, particularly at Valentine's and Mother's Day, or similar gift-giving occasions. In addition, you may want to consider having your flowers delivered the afternoon before a particular event, both to ensure they are are enjoyed throughout the big day and to provide a cushion for redelivery just in case the recipient is not home when your flowers first arrive. Being a day early never hurts, but being a day late can! Otherwise, for same day delivery across most of the U.S. and Canada, simply order in the morning. 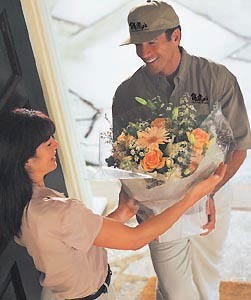 In most cases, your flowers can arrive that afternoon. If you order flowers by phone, tell your florist the sentiment you want to communicate. Remember, your florist is the expert, so don't feel that you have to know the name of every particular flower. Just mention the occasion, your relationship to the recipient, and if you have any favorite flowers or colors in mind. Allowing the florist to assist you with the selection of flowers and to design a bouquet just for you will often result in the best overall gift for your budget. So, you'll be more pleased with your flower delivery. Have the spelling of the recipient's name and his or her complete delivery address ready, including any apartment number, company name, suite, or floor number. Delivery to "Susie" at "Rockafellar Center" probably won't cut it. The recipient's phone number is also very helpful to ensure delivery, and may sometimes be required. After all, you want your flowers to arrive at the right place on the right day. So, make sure you've got your facts straight. As important as the flowers are, if you don't take a few moments to think about the card message, your sentiment could be lost. Florists will include a small enclosure card free of charge, and larger gift cards are also available. Have a short message ready when you call, or ask for your florist's advice. If you order flowers online, most sites will have suggestions for you. The important thing is to express yourself simply and personally. 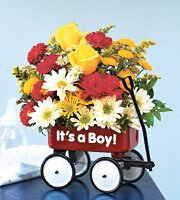 It makes your flower delivery gift all that more special. Also remember to include the sender(s) name(s) on the card, so the recipient knows who to thank. Remember that web sites can't show every flower arrangement. There is an infinite number of combinations possible, so don't be afraid to call if you don't see what you are looking for. Florists excel at creating beautiful one-of-a-kind designs for almost every taste and budget to help you send just the right message with every flower delivery. Sending flowers is a wonderful way to say, "thanks", "cheer up", "feel better soon", "congratulations", or "I love you". You can send flowers almost anywhere on almost any day, and there is something magical about how they make people feel. Floral gifts show how much you care, and at the same time they say a lot about you, the sender. Look to your local florist for help or visit your favorite online flower shop. You'll find that the age-old tradition of giving flowers is very much alive, and easier than you may think.